Melo missed three games this season with an academic-related problem. 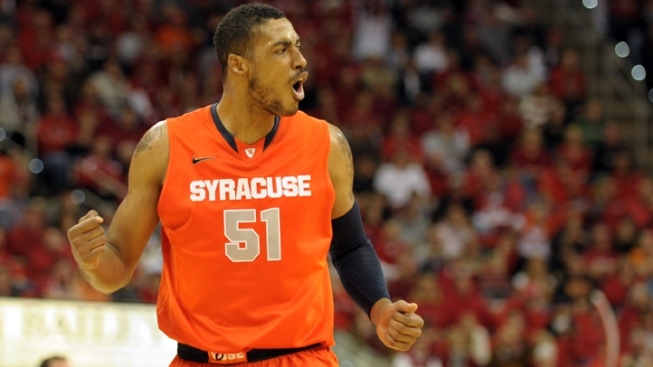 Due to an "eligibility issue," seven-foot Syracuse sophomore center Fab Melo will not play in the men's basketball championship, the team announced on their official website Tuesday. ESPN reported that it was an repeated academic issue. Melo missed three games earlier this season with reports of another academic-related problem. Without Melo in the lineup, Syracuse suffered their only loss in Big East play on Jan. 21. After a rough rookie season, Melo bounced back strong as a sophomore. A key factor in Syracuse's offensive rebounding game and defense with his blocking ability, Melo was a cog in the team's 2-3 zone defense this season. His solid play in the post and in-transition gave him even more value. His size also helped his teammates get the neccesary space to shoot. Without Melo, the team will rely on the streaky shooting of Kris Joseph and Dion Waiters and the rebounding ability of C.J. Fair. This season Melo has averaged 7.8 points, 5.8 rebounds and led the team with 88 blocks. It was also reported that he did not travel with the team to Pittsburgh for their game against UNC-Ashville.